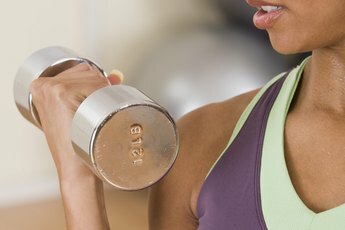 Exercise regularly to gain muscle instead of fat. 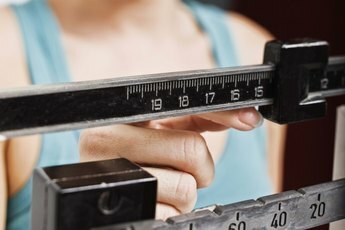 Although many women desire to lose—or gain—weight at a rapid pace, slower is better when it comes to altering your body weight. According to Weight-control Information Network, the majority of women in the U.S. are classified as overweight or obese. However, underweight women or competitive athletes—like bodybuilders—may try to gain a few extra pounds of lean muscle mass. Shedding fat and packing on the pounds require similar strategies. According to the National Heart, Lung and Blood Institute, losing 1 to 2 pounds per week is a safe rate and can help you keep lost weight off long-term. A one-half to 1-pound per week increase is a good rule of thumb when it comes to weight gain. The University of California Los Angeles reports that during the first three months of a weight-gain regimen, you should see gains of up to 3 pounds per month. To lose or gain weight, an adjustment in your calorie intake is often necessary. The National Heart, Lung and Blood Institute recommends reducing your current intake by 500 to 1,000 calories per day to lose 1 to 2 pounds per week. The U.S. Anti-Doping Agency suggests to effectively build muscle and gain weight you should increase your energy intake by about 500 to 1,000 calories a day. Your total calorie needs for weight loss or weight gain are based on your body weight and activity level. The National Heart, Lung and Blood Institute suggests most women need 1,000 to 1,200 calories a day for effective weight loss, but active women and women who weigh 165 pounds or more likely need 1,200 to 1,600 calories per day to lose weight without feeling hungry. To gain muscle mass, North Carolina State University recommends eating about 24 to 27 calories per pound of body weight each day. This means a 115-pound woman would need about 2,760 to 3,105 calories each day to gain weight at a healthy pace. To effectively gain muscle versus body fat, train with weights – or your own body weight -- on a regular basis. You can lose – or gain -- more than 1 to 2 pounds per week, but doing so may come with risks and unpleasant side effects. Although you can lose 3 to 5 pounds per week using a very low-calorie diet containing 800 or fewer calories per day, these diets are only recommended when supervised by a doctor, according to Weight-control Information Network. Eating too many calories to gain weight – especially if you’re not working out regularly -- can lead to fatigue, bloating and gaining body fat instead of muscle. Can You Lose Weight If You Eat Under 2,000 Calories a Day? What Is the Daily Caloric Intake for a 200-pound Woman?